Create a stunning custom iPhone 8 case. Your personal photo on the back and sides. Rubber lining to ensure extra protection. Are you the klutz of your family or friend group, always dropping your phone and are in need of some extra protective insurance. 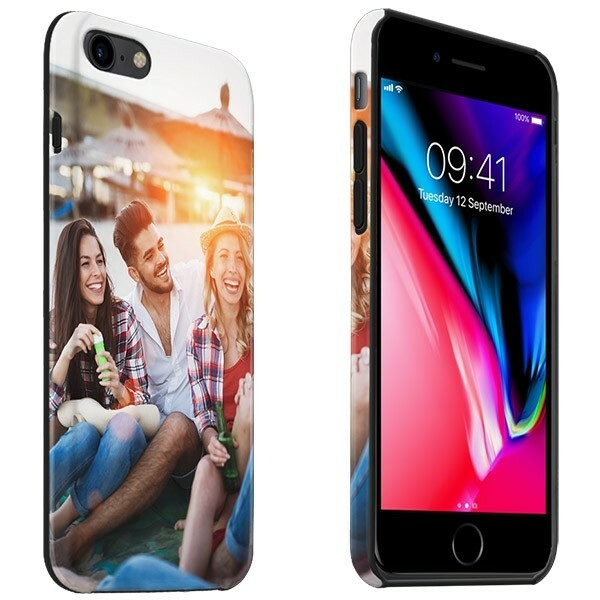 With GoCustomized, you can now design a custom iPhone 8 case that gives your phone sturdy protection for life's unexpected moments. The tough case for the iPhone 8 has extra silicone reinforcement. The silicone insert in the tough case allows your iPhone 8 to fall with confidence. Of course, the stellar protection is not at the expense of the functionality of your iPhone. The custom hard case has cutouts for the camera and device buttons so you don't have to change the way you use your iPhone 8. Anyone can design a custom iPhone 8 case! We believe that there is an artist in everyone. Let your creativity run wild and design a one of a kind case for your iPhone 8 with your photo or design. The whole process can be done in three easy steps! You can upload all sorts of photos and images in our user-friendly design module so you can choose which looks best. You can also add text to give your custom case an extra personal touch. The possibility is endless, especially when you can upload photos straight from Facebook and Instagram. After you have finished making your custom iPhone 8 case, we will start working on it as soon as possible. An automatic process will print your case within a few minutes. After the production process, we send the case with the shipping method you have selected. You can expect the case at your doorstep within a few short working days. Do you have any questions about designing or about the custom iPhone 8 case itself? Please contact our customer service and we will happy to help!